I am known as the “make it with less dishes” kind of cook. My husband knows that if I can whip up a dish in one bowl I will, and if I can eat without lots of dishes it’s the best meal ever. 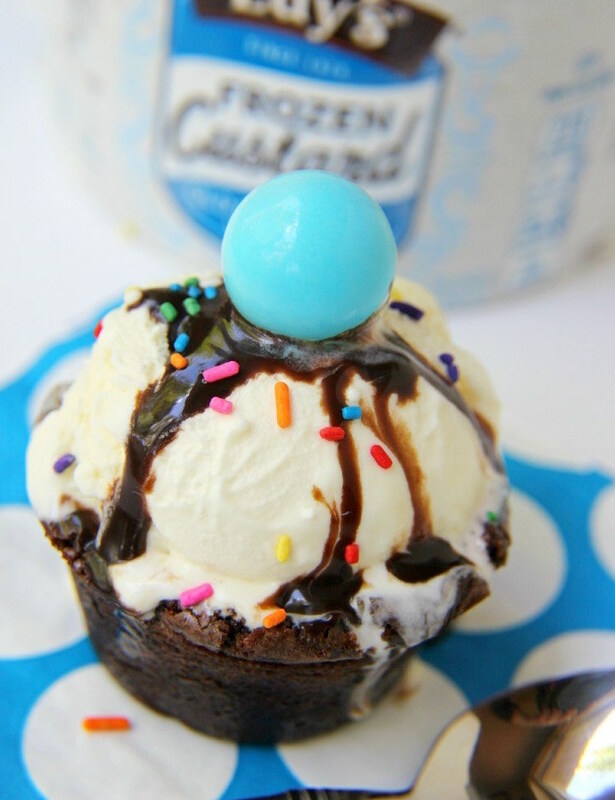 I love this dessert idea because I can make ice-cream sundaes right IN the brownie! No extra bowls or dishes – 100% edible. Awesome. Yes indeed! If there are is a way to make doing dishes even more heavenly this is it! I have always thought the brownie bowl idea was so clever and fun but I think they always needed some special pizzaz to add. And what was that extra little something they needed….peanut butter of course! Why? Well, because chocolate and peanut butter is like the best flavor combination on earth. . .that’s why. If you are allergic to peanuts or just aren’t a fan of that nutty combo, mint and chocolate has also always been a favorite of mine as well. With that just replace the mini PB cups with some Junior Mints or Mint chips. That special mix is quite top notch as well. Basically just get a brownie mix you love, add your pizzaz pieces part way through the baking, once cooked press with a second greased baking sheet and whalah, you’ve got brownie bowls. Now remember my love of not doing too many dishes, make sure your pans are well greased or you are going to hate scraping them off. That is a pet peeve of baking for me, so don’t over cook and burn those bowls and make sure they are well greased to save yourself that kitchen conundrum. Chocolate, Caramel, Peanut Butter or any kind of drizzle! I completely understand if you’re grabbing your keys to run to the store to get the ingredients for this dessert right at this moment. I’m considering doing the same thing. Desserts are my favorite dish and these edible dishes :) make it even more my fave. A simple, clever and fun dessert is a sure win in your household. What are your favorite simple yet fun desserts to whip out? Mix brownies in bowl according to instructions. Grease a muffin pan and fill each cup ¾ full of batter. Put the brownies into the oven and bake for 10 minutes. Remove from oven and place three mini peanut butter cups in the center of each brownie. Place back in the oven for 20-25 minutes or until the brownies are baked through. 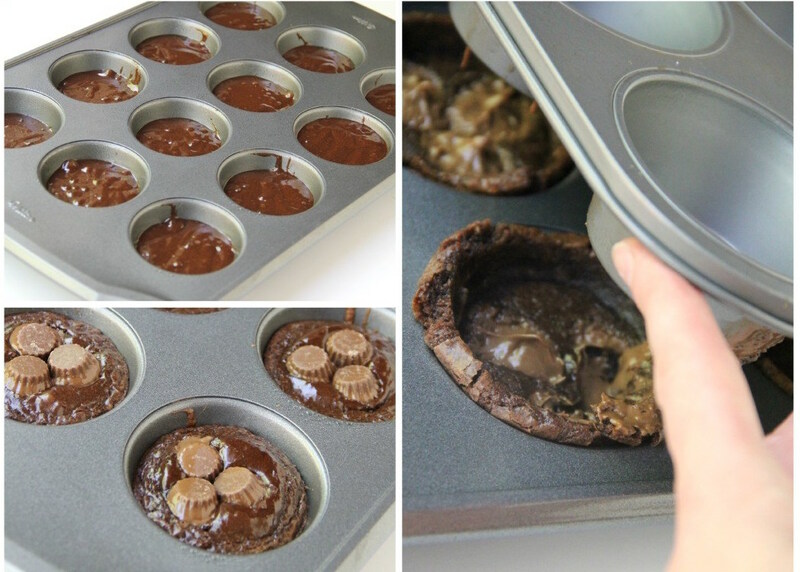 Grease the bottom of another muffin tin and place on top of the brownies while still warm. Allow to cool and then fill the brownie bowls with custard or ice-cream. **Top with chocolate syrup and sprinkles. Or a big gum-ball for fun!